Stemming from New Jersey is nothing new in the music world. It seems that every band and their mother are from the nuclear waste dump of the country, it must be all those toxic fumes producing some really fucked up lyrics. 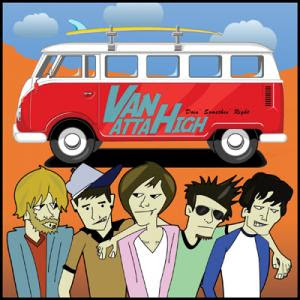 This past week a new gem may have emerged from among the piles of toxic garbage and that band is Van Atta High. Despite this bands apparent inability to retain members (4 of 5 are new to this record) they seem to have a feel for writing solid songs and have dominated their home state. With a national distribution deal now in place the band could be ready to take the big national step. Their latest album titled “Doin’ Something Right,” is now in stores and definitely worth a listen if your into the combination of whiny voices and poppy choruses. My favorite song on the album is my song of the week, a song that just seems to make sense to me. It has a really fun piano part layered with solid guitar and vocals. There is nothing complicated here and you can feel that the song was not over-thought. Check out the song and let me know what you think. I would also be curious to know whether you think this band has what it takes to punch into the emo/rock/pop scene at this moment? If you have to hate on Jersey that bad… you’re just jealous. Also, as a writer it’s bad practice to offend people in your “audience” for no reason. You stereotype a lot in your entries. P.S. They could definitely break into the scene, they just need to be in the right places at the right time and know the right people. Same deal as pretty much any band that has some talent or catchy rhythms to play. Um, Steve Jasko was definitely in the band when they released Run Like Hell, their previous CD to Doin' Somethin' Right, and I believe Clark Starace might've been too.